I love these old Pro Set SuperBowl MVP cards. Merv Corning is an amazing artist and did such a classy set for Pro Set. I wish they had done an addendum later and included the additional cards through the latest MVP using Corning, but this could obviously never come to fruition, especially with the dissolution of the Pro Set company and its assets some years ago. The white hitting Terry’s head as he stands there with his hands on his hips is just a stroke of genius. I can see why Terry didn’t autograph it directly on his likeness. So with Terry, don’t expect a response from him so quickly. He’s typically somebody who only signs about once a year- if that. I was incredibly shocked to have received a response from him in 9 days, but I suspect tax and off-season may have had something to do with that. I was alerted to him signing about 2 weeks before I got the success when I saw a few successes from other posters on the NFL TTM thread on Fanmail.biz, and dropped something quickly in the mail to him the next day. The Steelers had become a doormat of the NFL, but with the hiring of Chuck Noll in 1969 and a switch to the AFC, their fortunes slowly began to change. Bradshaw’s rookie season was horrendous, as he adjusted to the pro game, throwing 6 touchdowns and 24 interceptions. It’d be much of the same over the next few years, 13 TD – 22 INT (1971), 12 TD – 12 INT (’72), and 10TD – 15INT (’73). With a succession of strong drafts, talent would build, but so would frustration. At one point fans didn’t feel that Bradshaw was the key to the future of the franchise, but Bradshaw turned to his spiritual faith to press forward, and with that an amazing statistical transformation also took place. Shed of his stress and outward pursuits, Bradshaw began to refocus his life and thus began the era of the Second Super Bowl Dynasty- the Pittsburgh Steelers. 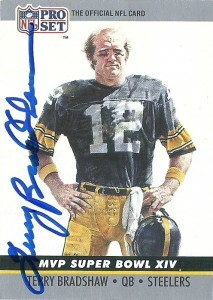 He’d lead the team to SuperBowl victories in 1974, 1975, 1978, and 1979. Bradshaw nabbed MVP honors in both 1978 and 1979, becoming the first two time back to back MVP since Bart Starr. What was more astounding was Bradshaw managed to put up his best numbers in what is referred to in NFL annuls as ‘the dead ball era’- a period of time in which passing favored defenders, so offenses were forced to more of a ground game approach. Although injuries claimed a significant percentage of the latter half of his career, he still managed to lodge 107 career wins and retired following the 1983 season. Among his other accomplishments was being named NFL MVP in 1978, and most people forget that he was an able scrambler, rushing for 35 touchdowns over his career. Bradshaw made the transition seamlessly into the booth, where he has developed a knack for being openly critical of players who do the sport wrong, and also his self-deprecating sense of humor. He was inducted into the Pro Football Hall of Fame in 1989, has appeared in a variety of media including television and movie acting, and has recorded some Country music. Terry was named to the Pittsburgh Steelers 75th Anniversary team, the NFL 1970’s All Decade Team, College Football Hall of Fame and was named the #50 NFL player of all time. In 2006 Bradshaw donated a truckload of his personal affects and awards to his Alma Matter, LA Tech for display at the institution. Truly a great guy.